Of course the simple and favorite answer is “it depends.” Rather than being that open ended, the Storm team has developed some structure and methodology around trying to answer this question (dating back to our own early start-up days when we founded Storm Ventures in September 2000). In an early stage start-up, time is money. and so the focus of any start-up is to drive their efforts to a minimum viable product (MVP) in the shortest time possible, with MVP being defined as the “minimum set of features that will drive revenue in the shortest time possible.” Easy to say, hard to do. Many different things need to be thought through, planned and executed on to make this simple statement a reality. Raising a round of capital is not the end all, it is the beginning, and it is important to think about what the next round of funding will look like (because in most cases there will be another round), and maybe even look at the round after that one. Optimizing around one single round of funding without looking ahead sets up the potential for future problems. The minute cash is in the bank, the clock starts ticking on what value can be created before you run out of cash. If you never run out of cash or create a business that is self funding then the clock ticking is not an issue. That is usually not the case. So prior to funding, we ask entrepreneurs (and ourselves) “How much money will you need to create significant value before your next round of funding?” This question forces the definition of what is considered to have value and over what time frame. 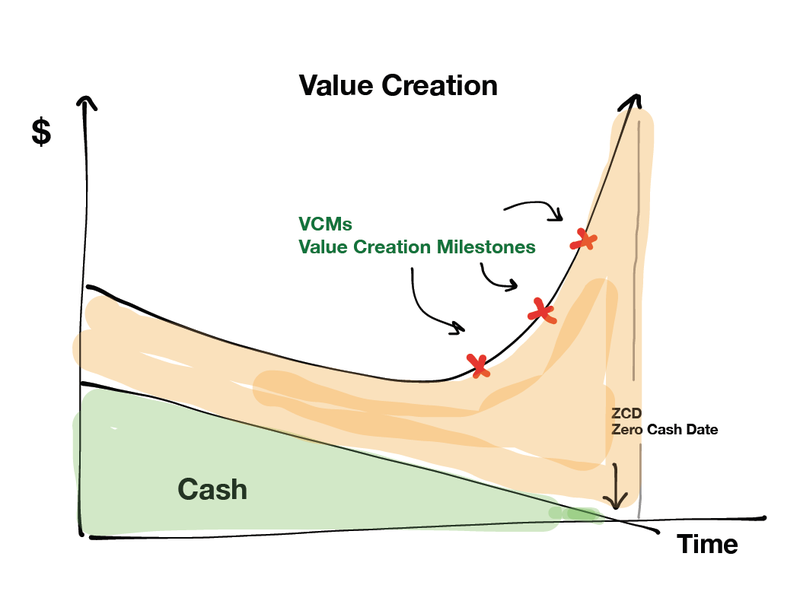 We call these VCMs or “Value Creation Milestones.” The goal between entrepreneurs and investors then becomes to mutually agree on what those VCMs should be in order to (exponentially) increase the value of the start-up before cash runs out and the need to raise additional capital. The chart below tries to show the relationship between time, cash, and value creation. What should the VCMs be? It depends on your business. It could be # of users, month/month growth in users or revenue, # of key partnerships, a high viral coefficient, # of beacon accounts, key customer beta trials, early customer POs, market share gains, or adding key talent, just to name a few. The important thing is that (1) there is agreement between investors and entrepreneurs on what the VCMs should be, so there is clear alignment as you build your business, and (2) there is agreement over what time frame this should be accomplished which will then help answer the question of how much capital might be required. January 31, 2014 in Start Up Advice, VC Learnings.